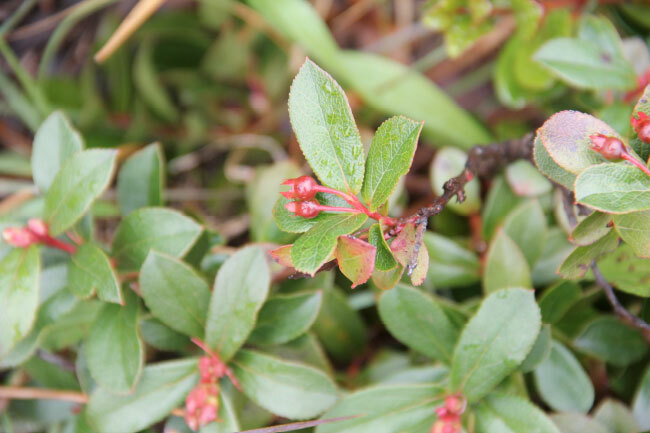 Vaccinium reticulatum, known as ʻŌhelo ʻai in Hawaiian, is a species of flowering plant in the heather family, Ericaceae, that is endemic to Hawai’i. It grows at altitudes of 640–3,700 m (2,100–12,100 ft) on lava flows and freshly distributed volcanic ash on Maui and Hawai’i, and less commonly on Kauai,Oahu, and Moloka’i. Adaptations to volcanic activity include the ability to survive ash falls of over 25 cm (9.8 in) depth. ʻŌhelo ʻai is a shrub usually 0.1–1.3 m (0.33–4.3 ft) tall, rarely up to 2 m (6.6 ft). The leaves are evergreen, spirally arranged, leathery, oval, 1–3 cm (0.39–1.2 in) long, red when freshly emerging, then green or green with reddish patches. The flowers are bell-shaped, 8–12 mm (0.31–0.47 in) long, variable in color, red to yellow or pink.The fruit is an edible berry 8–14 mm (0.31–0.55 in) diameter, ranging in color from blue to purple to red to orange to yellow. The color does not necessarily indicate the ripeness of the berries. The berries taste similar to the related cranberries, less ripe ones being tart, while ripe berries are quite sweet. They are an important food source for the nēnē (Branta sandvicensis); the seeds are dispersed in the birds’ droppings.